Though Johann Sebastian Bach (1685-1750) never visited Italy, he was constantly interested in Italian music throughout his life: he meticulously studied the style of Italian composers of the past (such as Palestrina and Frescobaldi) and of his own time (such as Vivaldi and Pergolesi). His numerous transcriptions and arrangements from Italian models date not only from the years of his compositional apprenticeship, but constitute a red thread leading up to the very last years of his life, when he still took inspiration from Italian masters and their work. Conversely, many of the most interesting figures of the Italian musical scene were fascinated and intrigued by Bach’s opus and style: from the admiring words of Bach’s contemporary, the erudite Bolognese scholar Padre Martini, to Busoni’s unforgettable piano transcriptions, Bach’s impact on Italian music may be not immediately apparent, but is nonetheless deep and influential. This CD collects a series of keyboard works which offer a fascinating overview on this two-sided relationship. Bach’s Concerto in D-minor BWV 974 is one of the several keyboard transcriptions from Italian solo concertos realized by the German composer; in this case, the original work was an oboe concerto by the Venetian patrician Alessandro Marcello (1673-1747). This exquisite piece has a rich melodic vein, which reaches heights of intense and touching beauty in the well-known slow movement. The challenge faced by Bach in this and in his other transcriptions was to transfer the timbral and dynamic variety of orchestral works to the less-nuanced instrumental medium at his disposal. His masterly knowledge of harmony, counterpoint and texture allowed him to choose compositional solutions whereby neither the mellow and penetrating sounds of the solo oboe, nor the gorgeous and warm timbre of the string orchestra get – so to say – lost in translation. 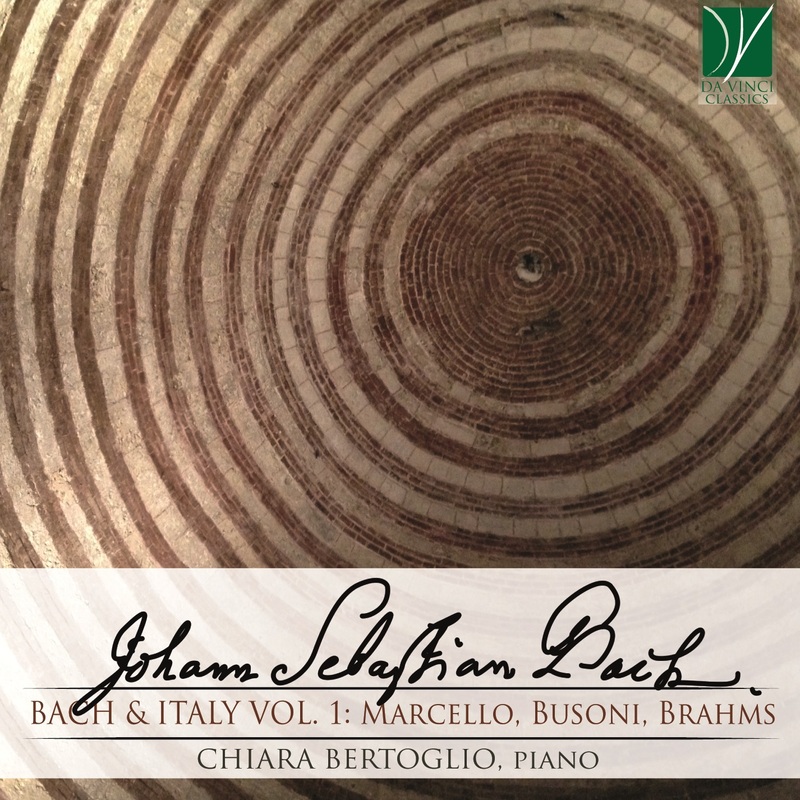 The experience acquired by Bach through his careful transcriptions seems to blossom in his own Italian Concerto, which could be described as one further keyboard arrangement of a virtual and imaginary Italian orchestral model. The compositional form of the solo concerto, observed in countless examples by Vivaldi and others, is faithfully respected; the contrast between solo and tutti, between concertino (the soloists’ ensemble) and concerto grosso is mimicked through the use of harpsichord registration and of textures of varying density. Bach’s Italian Concerto shares with Marcello’s the elegiac and lyrical beauty of the second movement, framed by the brilliant and lively vivacity of the first and third. In spite of the “Italianness” of the work, however, the German master’s touch is clearly discernible: not only in the rich contrapuntal writing, but also in the thematic use of a chorale tune fragment (“In Dir ist Freude”, “In Thee is joy”) in the third movement, as if suggesting that the radiant felicity of this work springs from a spiritual and supernatural source of joy. Chorale tunes interweave in a yet more pervasive and structural fashion the sublime Chaconne, as recently demonstrated by Helga Thoene. This dance, originally concluding the Second Partita for solo violin, is made of a series of variations on a bass: throughout the piece, however, a series of hidden Chorales builds up an extraordinary spiritual itinerary, in which the Chorale sequence possibly represents Bach’s response to the loss of his first wife, Maria Barbara. If the first Chorales depict the unavoidability of death and the human attempt to flee it, later the Christian believer enters into a spiritual dialogue with Christ and his Passion. Thus, in a moment of unforgettable musical beauty (when the key shifts from D-minor to D-major), God’s response does not fail the praying man: the only answer to human grief and to the questions it poses is, for the believer, Christ’s incarnation, through which our very sorrow is assumed by God. Therefore, even in the midst of extreme suffering, joy becomes possible: the violin imitates trumpet sounds, which evoke – at one and the same time – both a festive climate and the resurrection of the dead, announced by heavenly fanfares in the Bible. When the minor key reappears, therefore, it does not represent a return to reality after a dreamlike illusion; rather, it is the extremely human experience that faith does not exclude the grief of mourning, giving it, instead, a new meaning. Thus, the last Chorales rehearse the abandonment to God’s will and the trusting faith in a life after death. The arduous spiritual itinerary sketched by the Chorales corresponds to the transcendental difficulty of this piece on the technical and performance plane for the solo violinist. Whereas Busoni’s well-known piano transcription emphasises the spectacular component of virtuosity, Brahms’ more intimate version for the left hand alone transfers to the piano the strenuous efforts of the violinist and the extreme technical demands posed by the piece, so that the almost ascetic experience of its performance mirrors the complexity of the spiritual content. beauty are one of the highpoints of classical music of all times. Performed with repeats and in their entirety, the Goldberg Variations last approximately eighty minutes, which is much more than any average audience of the early twentieth century could appreciate. Struggling between pragmatism and fidelity, Ferruccio Busoni (a great concert pianist and composer, and possibly one of the most perceptive Bach interpreters ever) proposed a shortened and revised version of the Variations. The most controversial aspect of his arrangement is, of course, the suppression of many pieces, most of which are canons: consequently, the masterly compositional structure of Bach’s work is utterly destroyed. Moreover, to modern ears, the replacement of the ultramundane purity of the Aria da capo with a spectacular Finale and with a majestic, organ-like Chorale is hardly acceptable. On the other hand, some of the many changes made by Busoni on Bach’s score are extremely sensible and technically valuable (for example, in the redistribution of virtuoso fragments between the two hands, in response to the challenges posed to the pianist by Bach’s writing for a harpsichord with two manuals). Even the harshest critics of Busoni’s version, nonetheless, should acknowledge the historic value of this arrangement, as a valuable witness of Bach reception and interpretation, and as a first step for the popularization of his works. Those less prejudiced, however, will undoubtedly appreciate the unique beauty of the resulting composition: a beauty unlike that of the original, of course, but – at the same time – an artwork with a stringent consistency and a musically convincing structure. A work, in sum, which never fails to achieve its particular and admitted goal: to spread the knowledge and appreciation of Bach’s music among those who would otherwise ignore its beauty, its depth, its fascination. Benedetto Marcello: (b Venice, 24 June or 24 July 1686; d Brescia, 24 July 1739). Italian composer and writer. The son of a Venetian nobleman, he followed the career path of all Venetian nobles of his time: he was admitted to the Maggior Consiglio of the Republic on 4 December 1706 and, after completing studies in literature and law, served in various magistracies over the next two decades. The last decade of his life is riddled with mysteries: he married the commoner Rosanna Scalfi, his singing pupil, in May 1728; had a religious experience in August of the same year; was exiled to the Istrian city of Pula (then part of the Venetian Republic) for three years (1730–33) as provincial governor; was absent from civic records for the next five years; and received his final appointment in Brescia as chief financial officer. It is not easy to segment the musical continuum of Marcello’s life, since he held no regular appointments of a musical nature and the majority of his musical works are undated. This demonstrates how severely separated in social experience dilettante composers were from the common ranks of musical maestri. Nonetheless, Marcello’s cultivated intellect exerted, particularly through his psalm settings and cantatas, a major influence on Italian musical thought and performance throughout the 18th century and, to various degrees, on the musical practices of many other European countries until the end of the 19th century. After a perfunctory involvement with instrumental music, his main interests as a composer, particularly between 1710 and 1720, were the cantata and the chamber duet. Thereafter, his attention turned to works on a larger scale: the 50 Psalms of David, the serenata and the oratorio. The claim that Marcello forwent composition after 1728 cannot be entirely true since two of his oratorios neatly circumscribed his years in Pula. Marcello’s intent in his Salmi, which were published with etchings by Sebastiano Ricci, was to restore dignity to devotional music by reviving musical practices of antiquity (seeillustration). They are set in texturally differentiated sections and are for the most part through-composed. Numerous testimonials (by Gasparini, Antonio and Giovanni Bononcini, Sarri, Mattheson and Telemann) were included in each of the eight volumes. Caldara, who found the music ‘eccentric’, was one of Marcello’s few detractors. Later Italians, in particular Padre Martini and Giovenale Sacchi, revered Marcello’s Salmias models of contrapuntal writing. Still more accomplished examples are the six-voice canon In omnem terram, published with the psalms, and the four-voice Missa Clementina, which Marcello composed for his admission to the Accademia Filarmonica, Bologna, in 1711. Being impressed with the fact that women were not permitted to sing in the ancient temple, Marcello favoured low, mainly male, voices in his psalms. Some 16 of the works incorporate sections based on quotations from Greek and Hebrew psalmody; the original sources are interpolated at the appropriate points. Like his secular vocal music of the 1720s, which is inspired by Roman and Greek epics, the melodic content varies from an ambitus which is very restricted to one which is almost impossibly broad, expressing emotional peaks and depths. In the 1710s, when Marcello was coaching the young Faustina Bordoni and writing music for Roman nobles, such as the Borghese family, he led, in parallel with Apostolo Zeno’s attempted reform of the opera libretto, a movement to reform singing style. Here his goal was to remove ‘tasteless’ ornamentation and to focus more on actual sound. In this phase of his life, his vocal music was much more lyrical and formally structured. Several of his chamber duets were composed for Laura and Virginia Predieri. The vast majority of his lyrical cantatas seem to have been written for performances at weekly academies (social gatherings of the nobility that featured poetry, music, oratory and debate). The texts, many of which were written by the composer, were usually pastoral. Mattheson praised the rhetorical detail of Marcello’s approach to the setting of (lyrical) aria texts. More original are Marcello’s intensely dramatic cantatas on tragic and heroic subjects from antiquity, which feature such figures as Andromeda, Arianna, Cleopatra, Dido, Medea and Timothy (probably mediated through the dramas of Corneille and Racine). Some of these works lack arias: others use abberations of musical notation to express a heroine’s (or hero’s) mental frenzy or anguish. Although the subject matter is again usually from antiquity, Marcello’s serenatas are somewhat more conventional and use obbligato instruments and instrumental figuration to reinforce images and to convey elements of the drama. The lighter side of Marcello’s nature was expressed in his several satires. Of prime importance among these is the treatise Il teatro alla moda, first published anonymously in 1720, which is concerned especially with the decline of careful composition and well-rehearsed performance, as well as the invasion of Bolognese singers, at the Teatro S Angelo, Venice. It was especially popular in Italy in the 18th century, in France in the 19th, and in Germany in the early 20th, and it appears never to have been out of print from the time of its writing to the present. Comic musical works include the letter cantata Carissima figlia (1718), in which the singing styles of such opera figures as Vittoria Tesi, Faustina Bordoni and Gaetano Berenstadt are imitated; the castrato madrigals, in which it is debated whether the divinity of the singing of (adult) male sopranos and altos can save them from eternal damnation (1715); and the comic intermezzos Spago e Filetta (?1719). Although Marcello’s two late oratorios are not satirical works, a playful mood prevails. The impetus for the keyboard and recorder sonatas is likely to have come from academies. While the Marcello family had one of its own on the Fondamenta Nuove in Venice, Benedetto seems to have maintained a network of contacts in Rome, Florence, Bologna and various rural retreats in the Veneto. Only the motivation for composing the Concerti op.1, remains unaccounted for. These works now lack the principal violin part and so accurate evaluation is impossible. Within this opus was the one piece by Marcello known to, and transcribed by, Bach. Of Marcello’s keyboard works, the sonatas are the most important, for they seem to have played a role in the establishment of the genre as it was later developed by Platti, Pescetti, Galuppi and J.C. Bach. His cello sonatas, which are among his most widely performed works today, were probably composed much earlier than their date of publication suggests and, in fact, their authenticity is not beyond question. Marcello’s legacy was greatest for those who lived between 1750 and 1875, when recognition of his Salmi led to their translation into many other languages (French, German, Swedish, English, Russian) and their performance, as liturgically generic sacred works, in a host of different liturgical contexts. It was during this period that a great number of the manuscripts in which Marcello’s secular works are now preserved seem to have been copied. In the 19th century the Salmi were sometimes divided into short ‘motets’ or ‘songs’, or stripped of their texts and offered as instrumental works, or retexted and offered as ‘new’ works. Such varieties of psalm progeny seem to number well beyond 10,000 (arrangers included Paer, Mayr, Rossini and Bizet; Verdi was a great enthusiast). Another work of the same period, the oratorio Joaz, is reckoned to have anticipated the reforms of Gluck many years later. Marcello’s call to restore the classical virtue of ‘noble simplicity’ in music, found in the preface to his Salmi, anticipates the analogous invitation of the German archaeologist Winkelmann (who spoke of sculpture) by 30 years. Although little noted today, Marcello’s role in formulating the values of classicism and promoting their musical implementation was his most significant contribution to cultural history. His influence was enormously, if subtly, pervasive. Differing national values coloured perceptions of Marcello’s music: the English revered its ‘harmony’, the Germans its ‘melody’ and the Italians its ‘counterpoint’. It was only in the 20th century that Marcello’s name started to fall from grace in lists of important composers in the past. Even as this change occurred, however, the influence of his Salmi was regenerated in ethnomusicology: the materials Marcello quoted from Judaic and Hellenic traditions in the 1720s are frequently requoted (often without attribution) in studies of ancient and oriental music. He undoubtedly would have been amused by the reflexive nature of the esteem that accrued to his work after his death. Ferruccio Busoni: (b Empoli, 1 April 1866; d Berlin, 27 July 1924). Italian composer and pianist, active chiefly in Austria and Germany. Much to his detriment as composer and aesthetician, he was lionized as a keyboard virtuoso. The focus of his interests as a performer lay in Bach, Mozart and Liszt, while he deplored Wagner. Rejecting atonality and advocating in its place a Janus-faced ‘Junge Klassizität’, he anticipated many later developments in the 20th century. His interests ranged from Amerindian folk music and Gregorian chant to new scales and microtones, from Cervantes and E.T.A. Hoffmann to Proust and Rilke. Only gradually, during the final decades of the 20th century, has his significance as a creative artist become fully apparent. Johann Sebastian Bach: (b Eisenach, 21 March 1685, d Leipzig; 28 July 1750). Composer and organist. The most important member of the family, his genius combined outstanding performing musicianship with supreme creative powers in which forceful and original inventiveness, technical mastery and intellectual control are perfectly balanced. While it was in the former capacity, as a keyboard virtuoso, that in his lifetime he acquired an almost legendary fame, it is the latter virtues and accomplishments, as a composer, that by the end of the 18th century earned him a unique historical position. His musical language was distinctive and extraordinarily varied, drawing together and surmounting the techniques, the styles and the general achievements of his own and earlier generations and leading on to new perspectives which later ages have received and understood in a great variety of ways. The first authentic posthumous account of his life, with a summary catalogue of his works, was put together by his son Carl Philipp Emanuel and his pupil J.F. Agricola soon after his death and certainly before March 1751 (published as Nekrolog, 1754). J.N. Forkel planned a detailed Bach biography in the early 1770s and carefully collected first-hand information on Bach, chiefly from his two eldest sons; the book appeared in 1802, by when the Bach Revival had begun and various projected collected editions of Bach’s works were underway; it continues to serve, together with the 1754 obituary and the other 18th-century documents, as the foundation of Bach biography. Johannes Brahms: (b Hamburg, 7 May 1833; d Vienna, 3 April 1897). German composer. The successor to Beethoven and Schubert in the larger forms of chamber and orchestral music, to Schubert and Schumann in the miniature forms of piano pieces and songs, and to the Renaissance and Baroque polyphonists in choral music, Brahms creatively synthesized the practices of three centuries with folk and dance idioms and with the language of mid- and late 19th-century art music. His works of controlled passion, deemed reactionary and epigonal by some, progressive by others, became well accepted in his lifetime.